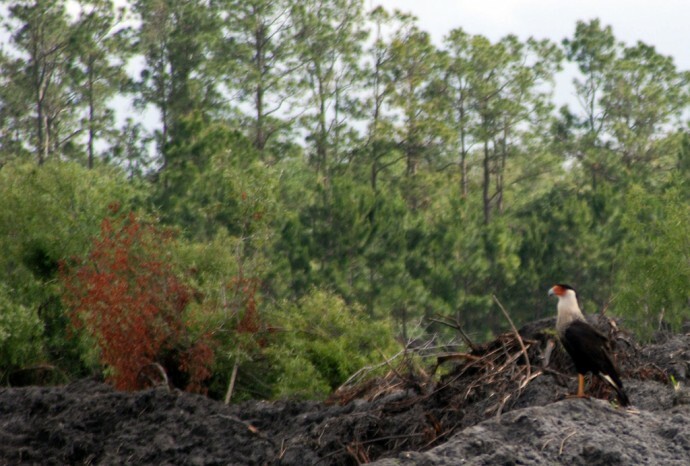 An unusual-looking Florida raptor, the crested caracara is Mexico’s national bird. They are members of the falcon family, but their heads look very parrot-like—a red face and a thick curved bill offset their black-and-white plumage. Although they will eat insects, reptiles, and fish, they won’t turn their beaks up at carrion if it’s easily available. Caracara prefer open, grassy rangelands, and are mainly found in Florida between Lake Okeechobee and Lake Kissimmee, seen along the vast prairies and waterways of this region. We’ve spotted them as far north as the St. Johns River floodplain near Mims. Just saw a Caracara of I-95 & 404. It was in a latge bunch of black vultures. I don’t know if he was trying to blend in, but i didn’t work. Just had a visit from a Caracara in Alva, FL. I live on the Caloossahatchee River, he was in a tree for quite a long time. Beautiful!